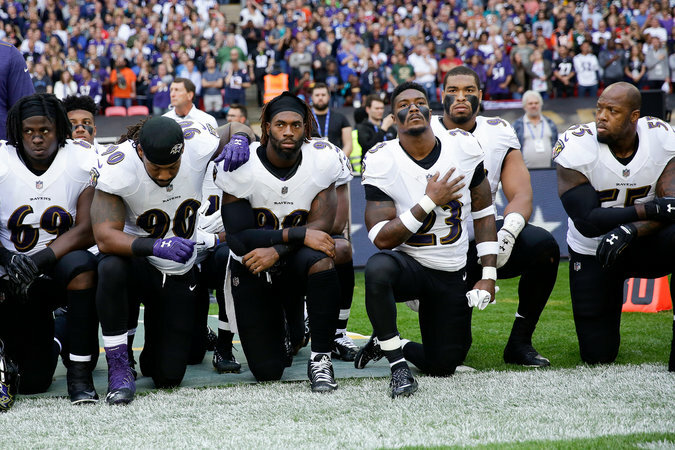 Players of the Baltimore Ravens kneel during the national anthem before the game against the Jacksonville Jaguars in London. N.F.L. players and owners, already on edge following critical statements made by President Trump at a rally on Friday night, woke up on game day to another series of tweets from the president, this time calling for football fans to boycott N.F.L. games unless the league fires or suspends players who refuse to stand for the national anthem.